TM 5-6115-628-14&P WARNING 5-4 When lifting generator set, use lifting equipment with a minimum lifting capa- city of 3500 lb. Do not stand under generator while it is being lifted. Do not permit generator set to swing. Failure to observe these precautions can cause injury to personnel or damage to equipment. 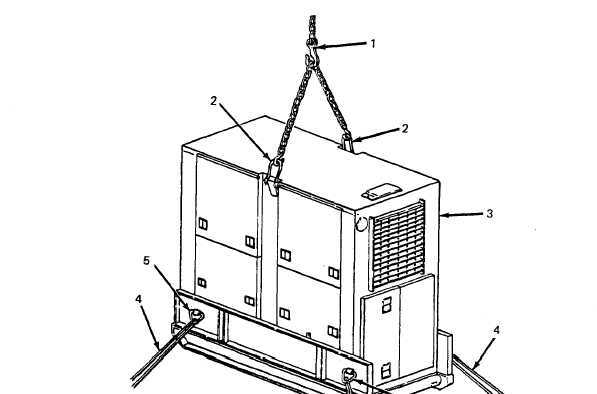 (3) Attach lifting equipment with a minimum lifting capacity of 3500 lb (1, figure 5-4) to both lifting eyes (2) on top edges of generator set (3). Insert a rope (4) through each of four tiedown rings (5) on generator set. (4) With one person at each rope to steady and guide generator set (3), lift generator set off of trailer. Figure 5-4. Lifting Generator Set.